My crit partner Stephanie said that in an email back in January, and it really stuck with me. The ways I have been shaped by my writing buddies. The marks I leave on them. The potential we have. The places we are going. I have 3 local crit partners, and 2 we-know-each-other-in-real-life-but-don’t-live-nearby crit partners. Let me go chronologically. I met John (or Ding, as I more commonly call him) through my first boyfriend. They were best friends. Somewhere along the way, I lost the one and gained the other. Now Ding is pursuing law school, but reading and writing have always been his passions. He sends me snippets of whatever he’s working on (usually a different story every week, haha) and offers me valuable feedback on mine. And a boy’s perspective! Erin and I knew each other in college, where we both studied Creative Writing and even had a few classes together, but we were peripheral friends at best. Then a year or so after graduation, I emailed her about something, she emailed me back, and we hit it off. Now I consider her a close friend, and a role model. Last year she snagged a fantastic agent, and her Young Adult fantasy novel is currently on submission to editors. The local gals are Sarah, Steph, and Ingrid. We broke off from a larger group of writers here in Cincinnati, since we were all writing Young Adult novels. Now we meet every week to share our new pages, eat goat cheese and chocolate, and go off on tangents. Sarah and I both have our own blogs (check out her post about our writing group, “Peter Pan Club”) but Steph and Ingrid do not. Or rather, did not. Until now. 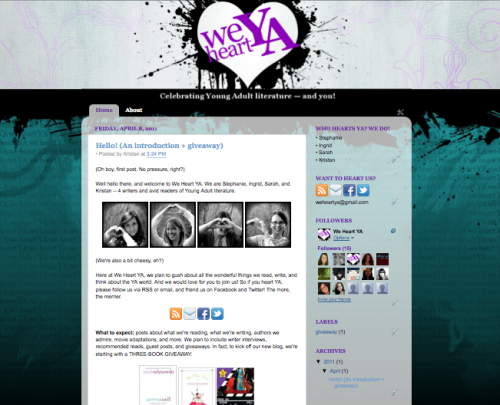 We Heart YA is a new group blog that intends to celebrate Young Adult literature. The four of us will talk about what we’re reading, what we’re writing, and whatever else we think about the YA world. If you’re interested in that, please hop on over. (We’re also on Facebook and Twitter.) To launch our project, we’re giving away 3 YA books! So that’s the crew. Well, there are a lot of other people who have contributed to who I am as a writer — who continue to contribute. A good number of y’all, I hope you know. But these are the 5 who have to endure my first draft crap, lol. Someday everyone will know their names, read their books, and see their movies. For now, though, I figured they deserved at least my recognition. Having supportive writing friends is definitely nice, dare I say it, necessary. I hope your new blog accomplishes whatever it is that you want it to accomplish. It’s interesting how one blog oftentimes begets another. I’m now imagining your blog and Sarah’s blog rubbing up against each other one night and then, Oh look what happened! “your blog and Sarah’s blog rubbing up against each other” bwahaha! I’m so excited about our new site, and where we will all end up too. We just have to keep plugging away at our manuscripts…dilligent little workers…and I can see our books on shelves too. So proud to be your crit partner, Kristan!! Good to hear you have someone to read your work from “a boy’s perspective.” Us guys are so difficult to understand; just as men often get women wrong in their stories (you know the stereotypes), it happens to us too! Am about to jump over and look at your new blog-child! Sounds exciting. Every time you talk about crit partners I’m reminded that this is exactly what I need, I must do something about it! “But these are the 5 who have to endure my first draft crap” I now have giggle for the day. That’s it rough drafts are now officially being referred to as FDC. And umm yeah are you going to come back to that group? I’ve never been quoted before! (Not that I’m aware of, at least. Oh who am I kidding? He he he) Kristan, I feel so privileged to be one of your crit partners, and I’m crazy excited about our new group blog! Lol I wonder what our blogs would look like… I’m pictured Pixar-esque creations. Ditto! Right back at ya, ladies. Oh, haha, we’ve had this going on for a while, and we each still get back to the large group when we can. No worries, nothing is changing! You know we love you guys. visited and followed, contest entered. Good luck with the new endeavor to you and yours!